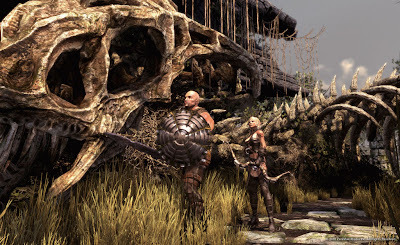 Hunted: The Demon's Forge seems like a game that will creep into Spring 2011 unnoticed. Most gamers I talk to have no idea what game I am mentioning when I bring this title up. However, I feel that it will exceed expectations. This preview is for the gamers that don't know a lot about Hunted. "The dark ages have become corrupted. Heinous creatures have emerged from underground. Townsfolk across the land are disappearing. 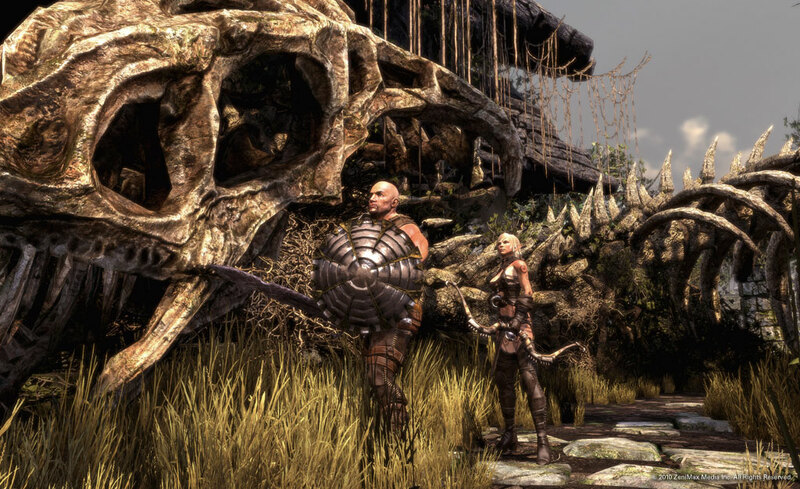 Upon the promise of their fortune in gold, mercenaries E'lara and Caddoc take on the daunting task of discovering where the innocent villagers have been taken. Their journey will lead them on a dark and twisted path where they will encounter death, slavery, and sacrifice. Travel deep within the world of Kala Moor...and to the secrets of The Demon's Forge." You have the power to control E'lara or Caddoc on your adventures. E'lara is a ranged weapons expert while Caddoc is a stron swordsman. Along your way, you will discover magic, treasurem, and plenty of vicious monsters ready to kill you. Sounds fun. This game has been labeled as 'action/adventure'. Sorry for all the gamers that anticipated this as a RPG, but it probably won't have many RPG elements in it. The game will play in a third-person combat style, and I would assume most people would want that anyways. Bethesda has not announced any online play, but it would be ideal. The entire (or most of) the story will be based on co-op play between E'lara and Caddoc. Giving the gamer some sort of multiplayer option would be helpful because these games tend to be more enjoyable that way. The story of the game is the only thing we can really be sure about for now. Everything else about the game is sort of up in the air. Hopefully the great minds at Bethesda (the same ones who brought us Fallout: New Vegas, and Oblivion) will deliver an action packed game for Spring of 2011. Bethesda Softworks has announced DLC for Fallout: New Vegas, but it looks like us PlayStation users are not invited to the opening party. Xbox 360 will be getting their hands on the DLC December 21, 2010. A PlayStation Store release date has not been announced. So, for now at least, we can only hope that this DLC, known as "Dead Money", will come to PlayStation. When, or if, it does, we will be sure to have a first look as well as a review upon its release. Let's hope it will not take 10 months to get here though. After much waiting, Sony announced earlier today that Gran Turismo will launch November 24, 2010. It's good to see the promise of keeping the launch in November was kept. Go ahead and pre-order your copy today so you can get straight into the realistic racing simulation as in releases. Electronic Arts announced on Oct. 27 that free DLC will be coming to Medal of Honor. Obviously this is just another reason that the game is making loyal fans happy. Let's see what it will have to offer. First of all the release of the pack is on Nov. 2, 2010. The new content will be available for PS3, Xbox Live, and PC. We can expect new a new game mode as well as new maps. The new game mode is called Clean Sweep. Players will have to work together, stay alive, and eliminate the other team to be victorious. The new maps are Bagram Hangar and Khyber Caves. We don't know if the new maps will be available for other game modes outside of Clean Sweep. Also, on Nov. 2. Hot Zone game mode will be available with two new maps. The two new maps are Hindukush Pass and Korengal Outpost. Although new DLC is always exciting, this is not free. This DLC will cost you $9.99 in the PlayStation Store. Stay tuned for more information on these DLC packs as the release comes around.